win $100 in Downtown Dollars! Join our mailing list and every week a new winner will be selected. For another chance to win visit us on Facebook and let us know what your perfect day is in Downtown Langley. JOIN OUR MAILING LIST FOR A CHANCE TO WIN $100 DOWNTOWN DOLLARS! Tell us about your perfect day in Downtown Langley! Florence & Chansong’s perfect day. Everyone likes to spend their day in different ways. Shopping, eating out, exercising, or just spending time with friends. In Downtown Langley, you will find that special place where you can choose exactly what will make your day perfect. Here, you can indulge in an early morning coffee, take a leisurely stroll with the family, have lunch with a good friend.  A place where you can shop to your heart’s content by day, and enjoy food, fun, and games by night. Visit us on Facebook, tell us about your perfect day and win Downtown Dollars. By participating in this contest & shopping in Downtown Langley, you support our economy! For every $1 spent in one of our amazing businesses, almost half of that gets reinvested in the sustainability and growth of our community. Thank you for choosing to support your family, friends and neighbours in building a success story we can all be proud of.